C's car is in the shop. She got a mini-van rental in the meantime. N likes it better than C's car. He particularly likes the sliding doors. We all agreed sliding doors are very practical and it is a shame more cars don't have them. Is it because they would be perceived as mini-vans and un-sporty? We also wished there were cars surronded with rubber and built so that minot bumps with other cars or objects wouldn't damage them. 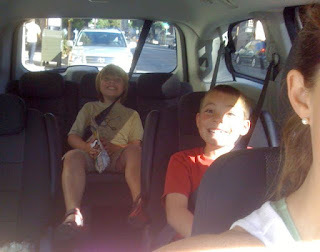 Like bumper cars... Maybe by the time the kids are driving (I sure hope so! ).